Correct cleansing with products that respect your skin’s acid mantle and hydrolipid layer provides the basis for healthy skin care. Our gentle cleansing rituals also support our no night cream philosophy. Your skin has different cleansing needs at different times of the day. Deep cleansing in the morning with Cleansing Cream using our ‘press & roll’ technique after the night time elimination activity of your skin. Evening cleanse with Soothing Cleansing Milk to remove make-up, eye make-up and the dirt and dust your skin picks up during the day. Why we recommend ‘Compressing & Hydrating’ to support Correct Cleansing. Never treat your skin harshly, it has to last a life time! Cleanse to remove dirt, oil and make-up without disturbing the skin’s natural line of defence. The acid mantle is your protection against bacteria, and the protective outer layer of skin cells help keep in moisture. We treat the natural 28 day skin cell cycle with respect. Soaps, lathering products, overly alkaline substances, scrubs and exfoliants (acids or gritty compounds) strip your face of this natural protection. This may result in dry, irritated or sensitive skin, more prone to sun damage, absorption of synthetic chemicals if used, and premature signs of ageing. Dr. Hauschka Cleansing Cream gently removes dirt and oil while protecting the skin’s natural defences and stimulating healthy lymph flow. It’s not a scrub, it’s a ‘press & roll’ technique. This encourages and supports healthy skin, and a clear, radiant complexion. If you have oily/blemished skin, those harsh cleansing products that make your skin ‘squeaky clean’ just make your skin produce more oil to compensate. Toner is the hidden gem of your Dr. Hauschka skin care regime. Yes, we know they’re often skipped for one reason or another, and they may not be considered as imperative in your morning and evening skin care rituals, however, Dr. Hauschka Toners are botanical treatment products, they are not like conventional toners that are used with cotton pads to remove last traces of make-up and cleanser. Close eyes and mist onto your skin. During the night your skin is regenerating, metabolising and eliminating the day’s waste, that’s one of its many functions as the largest organ in your body. There are no environmental factors that you need to protect your skin from while you’re asleep. A night cream – which is usually a heavy, expensive, occlusive substance, impedes your skin’s normal night time process. 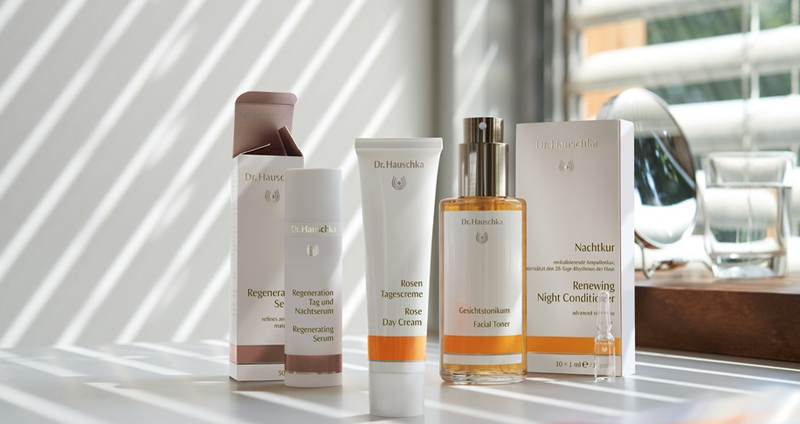 Dr. Hauschka’s gentle cleansing rituals support our no night cream policy. Our night treatment preparations, Night Serum or Regenerating Serum, embrace regenerating plant extracts held in an aqueous solution. These allow the skin to ‘breathe’ freely and overcome any weaknesses and imbalances. At first our ‘no night cream’ guiding principle seems unusual, however within one month (a skin cell cycle) you will need no more convincing! New customers support your skin in the transition off conventional night cream use with Renewing Night Conditioner, one ampoule a night for a month, then switch to Toner and Night Serum or Regenerating Serum. Note: No eye cream use at night either, just likely to give you puffy eyes in the morning. Use your oil-free Serum for night time eye care. Place around a large pea size of moisturiser in the palms of your hands. (1-2 pumps of Revitalising Day Cream, 2-4 drops if you are using Clarifying Day Oil). Warm the product between the entire palms of the hands to melt the natural waxes. Apply to skin that’s still moist from botanical treatment and hydrating Facial Toner or Clarifying Toner. This aids absorption of your moisturiser and ensures even and economical application of your moisturisers. Apply to your skin gently, pressing product in with the entirety of your palms, using both hands from the centre, outwards in the direction of lymph flow. WALA, the company that creates Dr. Hauschka Skin Care began in 1935 producing anthroposophical homeopathic medicines. Today around 1,000 remedies are still being produced. This background gives us superb medicinal, pharmaceutical and botanical knowledge. We also incorporate some homeopathic guidelines in the way we treat the skin. Though it might seem counterintuitive to apply Clarifying Day Oil to an oily skin, it’s actually the most effective solution. The skin knows whether it’s sufficiently protected, producing more of its own oil when skin is dry and less when it’s balanced. Drying, soap-based and overly alkaline products and conventional acne treatments may rob the skin of its defences, leaving it vulnerable to bacteria and triggering the sebaceous glands to produce even more oil. Dr. Hauschka’s Clarifying Day Oil provides a light, rapidly absorbed layer of pure plant oils and botanical extracts, including rich in provitamin A carrot root extract, that help to calm and regulate the skin’s oil production while helping to treat and soothe blemishes and irritation. There are many homeopathic guidelines to be found in the rhythmitised ingredients of Renewing Night Conditioner, Sensitive Care Conditioner and Intensive Treatments. For example pearl in Sensitive Care Conditioner, the pearl is the result of the oyster’s irritation. For example Revitalising Day Cream, available in 30ml and economical 100ml, is a particularly light textured and rapidly absorbed, yet it’s a highly activating daily moisturiser. If we treat dry skin with rich, heavy creams or oils we effectively trick our skin into believing it’s been producing too much of its own oil. We find this with the conventional idea of night cream use also. In response you may find your skin will decrease sebum production, perpetuating the dry skin cycle. Revitalising Day Cream is light enough that the sebaceous glands are called upon to increase oil production. Over time, the skin will regain its balance and be better able to fend for itself. Unknowingly women using conventional products may carry with them daily up to 500 synthetic chemicals. These pollutants are self inflicted through the use of conventional face, body, hair and make-up products. A non-natural moisturiser may contain around 30 synthetic chemicals and a perfume up to 400! WALA Homeopathic Medicines began in 1935 and Dr. Hauschka Skin Care was launched in 1967 giving us a wealth of medicinal, pharmaceutical, botanical and skin care knowledge and experience. We also draw upon centuries of herbal healing wisdom, combining traditional approaches with modern pharmaceutical processes to create gentle yet effective natural skin care products that work with the skin holistically. Our skin has an absolutely amazing ability to balance and heal itself, responding constantly to changes in our internal and external environments. It needs a little help along the way, like protection from exposure to harsh elements, or support when it gets thrown out of balance by lifestyle, hormones, transition, illness or stress. The key is to encourage and strengthen your skin’s own natural self-healing processes. Rather than suppressing symptoms or interfering with the skin’s natural rhythms, Dr. Hauschka Skin Care respects your skin, supporting its return to balanced health through the highest quality ingredients from nature that your skin can understand. The result, a typical Dr. Hauschka skin is a radiant, balanced and healthy skin! Hand harvested Anthyllis, in our biodynamic medicinal plant gardens. Anthyllis is one of our key ingredients to help guide all skin conditions to a state of balance. There is more to efficacy than high quality raw materials. Our formulations depend of course on the highest quality of the natural raw materials, but also on the care with which they were grown and processed. By using biodynamic (Demeter) agriculture, we put more into the soil than we take out and with our preference to hand harvest at dawn, we are choosing medicinal plants with the highest vitality. It’s this vitality we wish to pass on to your skin. Only when our ingredients are supported by our unique rhythmic manufacturing procedure do our products take on their distinctive quality that enables them to stimulate the skin’s own natural activity and re-establish its natural balance. What percentage of the ingredients in natural cosmetics are organic? What are the minimum standards and the maximum values? Furthermore: how can you describe the high quality of a product other than through its material properties – its finely tuned composition, its more than biochemical effect? Our entire range, skin care and make-up, is certified with the international quality seal for natural and organic skin care ‘NATRUE’. The NATRUE standard distinguishes between natural skin care, natural skin care with at least 70% organic ingredients and natural skin care with at least 95% organic ingredients. The term ‘natural skin care’ or ‘organic skin care’ alone is neither legally protected nor defined on a binding basis. At www.natrue.org you can find the certifications given to the individual Dr. Hauschka skin care products, this is your guarantee we are authentically natural and organic. WALA Medicines began in 1935 and we launched Dr. Hauschka Skin Care in 1967. We have a wealth of medicinal, pharmaceutical, botanical and skin care knowledge and experience. We also draw upon centuries of herbal healing wisdom, combining traditional approaches with modern pharmaceutical processes to create GENTLE yet highly EFFECTIVE natural, organic and biodynamic skin care products that work with the skin holistically. For over 50 years Dr. Hauschka has been devoted to creating skin care formulations from Nature. Our efficacy is based on our unique skin care philosophy, equally unique rhythmic processes and the highest quality natural ingredients with a preference for biodynamic, organic or responsibly wild harvested sources. The result: Healthy, balanced and radiant skin!